Help you easily edit audio with powerful features. Conducting science experiments, calibrating the audio equipment, testing your hearing or tuning music instruments are just a few reasons why online tone generators can be useful in a wide range of contexts. Most of the tools that enable you to generate different tones on online platforms are easy to use and they won’t take you too much time to get a hold of them. Furthermore, some of the online tone generators can even be used to improve health as some scientific studies have proven that a low-frequency tone can help treat the Alzheimer's disease. Regardless of the reason why you want to generate tones, these online tone generators will help you accomplish this task with ease. In case that you want to generate tone and then add it to your YouTube video, we recommend you to try FilmoraPro professional video editor . Generating tone with FilmoraPro is easy, just choose it from the Audio effects tab and then drag it to the audio track. You can choose from sine or square tone type and set up the frequency per your needs. Besides you can also use the Preset built in FilmoraPro or select from A4-G#4. Click the Free Download button to download the free trial version of FilmoraPro today. Each of the online generators listed below will enable you to hear a pure tone, and let you adjust the tone’s frequency. Make sure that the volume on your headphones or the speakers is properly adjusted to avoid damaging the equipment and your hearing. You can find a number of different options on this website that range from the Pitch Shifter that allows you to change the Pitch of the files you upload to the Online Tone Generator platform to Binaural Beats and DTMF Signals. After you land on the website’s homepage, you’ll be able to see a tone generator that lets you select the frequency, volume and the waveform of a tone. The frequency will be set to 44.1 kHz and the wave type will be set to Sine by default. You can insert any frequency value you want or choose between Sine, Square, Sawtooth and Triangle wave type options. The volume bar lets you control how loud the tone you’re generating is. The Play and Stop buttons enable you to start or pause the playback whenever you want, while the Save button lets you download the tone you created. 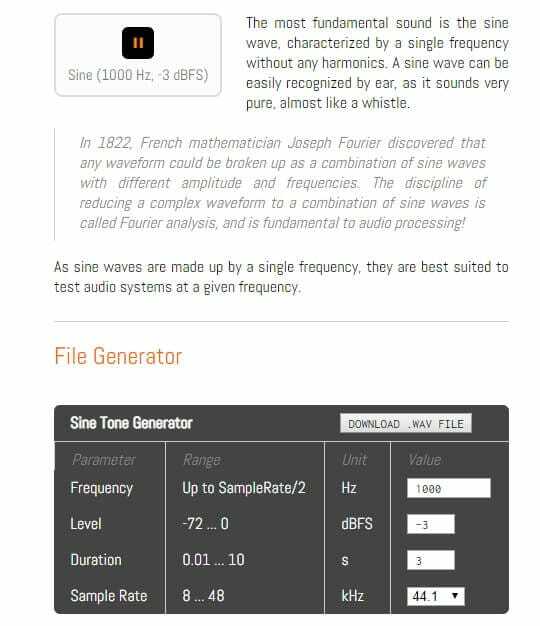 Generating Sweep, Dual or Sine tones with this online tool is easy, as you simply have to select the type of tone you want to generate. All sound files you can find on this platform are accurately calibrated, and you can adjust their frequency and amplitude. Clicking on any of the links available in the Tone Gen section of this website will take you to another page where you can adjust the properties of a tone before downloading it. In the upper left corner of the new webpage, you’ll be able to see the Play button that lets you hear the default tone you selected. Directly below you can find the File Generator option where you can adjust the properties of the tone you’re generating. The displayed options depend on the type of tone you selected. Clicking on the Download button will save the tone you generated to your computer, but you won’t be able to save a tone if you inserted an incorrect value into one of the boxes. Making tones on this online platform doesn’t require any effort at all since you can easily control the frequency of the tone using a large slider that is displayed across the entire page. Clicking on the Play button will play the tone under the current settings so you can make the necessary adjustments if you’re not happy with the results you’re getting. Several options that let you fine-tune the settings of the tone you’re generating can be found below the frequency slider. The volume and balance are located on the right side of the screen and they allow you to determine how loud the tone is going to be or to choose to which channel the majority of the signal is going to be sent. The value in the middle of the screen displays the current frequency of the tone. The arrows also allow you to change the frequency value, while clicking on the wave type selector lets you choose between Sawtooth, Sine, Triangle, and Square options. The tones you generate on this website can’t be downloaded to your computer, but you can use the Get Link option to send a tone to your email or to a friend. The free version of this website offers only a limited amount of tones that have a maximum duration of 5 seconds. Purchasing Basic, Pro or Corporate packages will grant you access to all types of tones this online tone generator offers, and the tones you download can last up to 300 seconds depending on the sample rate. The WavtonesAudio Frequency Signal Generator allows you to alter the properties of each tone it offers, even if you’re using the free version, but you can’t listen to any of the available tones before you download them. This makes it a bit more difficult to generate a tone in accordance with your current demands. Furthermore, the Bit Depth of all tones the free version of this online tone generator provides is limited to 16-bit. If you are looking for an easy way to generate tones from your browser this may be one of the best options available. 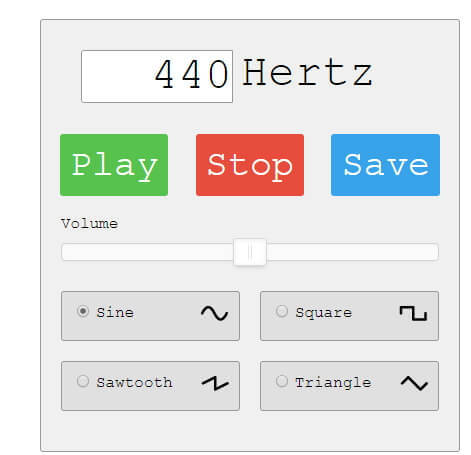 You can easily change the frequency of a tone by dragging the Hz slider, and the Fine Tune Hz slider enables you to find the perfect frequency of a tone. There are four wave types you can choose from that generate different types of tones and you can change their tonality by clicking on one of the buttons located near the bottom of the tone generator. Saving the tones you generate is not possible as Gieson TonGen website doesn’t offer this option. Using a link to send a tone you created is also not possible. 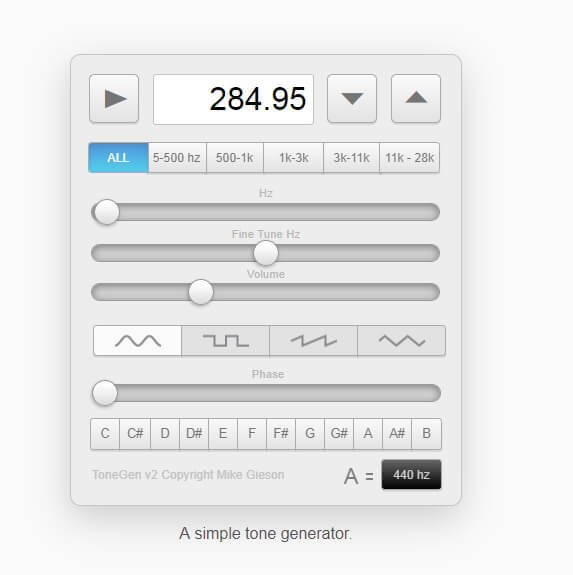 This online tone generator is a perfect option if you’re looking for a way to quickly generate a tone directly from your web browser, but it can be hardly considered a great option if you want to generate a tone for professional purposes. The scope of options different online tone generators provide can vary. That is the reason why your decision which of the tone-generating tools we covered in this article you are going to use depends on the reason why you’re creating a tone. What is your favorite method of generating tones? Leave a comment below and let us know. How to Mute Audio in Windows Movie Maker?